The central core of an extrusion operation is the die. Correspondingly, at the forefront of our new developments are advancements in die technology. Our objective is to continuously improve flexible film and tubing extrusion performance through higher performing die systems. Producing co-extruded product structures with more layers results in stronger more economic structures enhancing each polymer's unique properties. Dual Spiral Systems' dies help film and tubing manufacturers stay ahead of the competition. Is it possible to make 14 layer film on a 7 layer die? 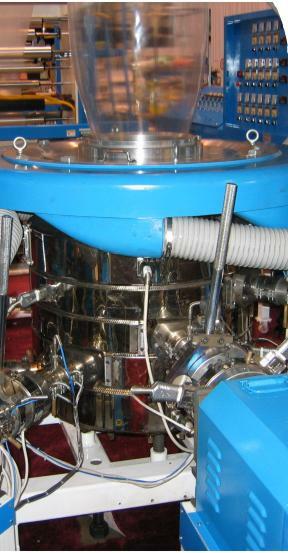 The Dual Spiral System (DSS) US patent 6,902,385 is a unique concept for co-extrusion blown film, blow molding and pipe production. The DSS enables processors to take advantage of the improvements brought about from adding layers without adding additional equipment costs. By dividing each individual layer into two separate layers, the enhanced structural and physical properties of each layer material can also be doubled. In this way a 7 extruder DSS die would in fact be producing a 14 layer film. Unlike micro layer dies that use only 2-3 different materials in a multi-layer structure, DSS dies can process as many different materials as there are layers within the die. Each layer is a unique flow distributor that processes a discrete layer within the die. DSS Layer splitting/doubling increases the strength of your film. This means a 2-ply film will be stronger than a single ply film of the same overall thickness. The same premise applies to gas barrier property. As the number of layers increases the number of interfaces between barrier layers also increases, hence providing a higher overall barrier property of the layer split film. The DSS provides a doubling of the number of layers in a die, superior streamlining and mixing of melt-flow, temperature isolation and a new standard in die design for simplicity and flexibility to add layers to the die configuration. Each DSS die system has computer designed flow passages based on plastics engineering software that optimizes pressure, residence time, and polymer distribution. The DSS is available from 1 to 32 layers, in die sizes of 1-55 in (25-1400mm), and includes DSS Die Signature software.